Actor Kim Bum recently revealed that he lost two toenails, surprising many fans with his statement. Kim Bum wrote on his Twitter, “Even though it rained a lot, I still went to play soccer~ I lost two toenails… I have 10 toes but only 7 toenails… ㅋ”. 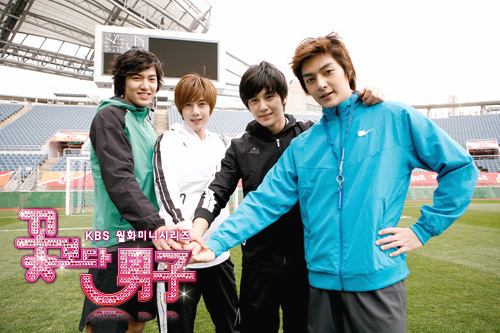 Kim Bum has been playing soccer since elementary school, and now he is on a team named ‘MEN‘ with Xiah Junsu, Kim Hyun Joong, and others. On the other hand, Kim Bum is set to star in the upcoming drama Haru with U-Know Yunho, Park Shi Hoo, Han Chae Young, Lee Da Hae, and Big Bang. Ouch. I think my toes just curled in pain. I wonder what happened to that last nail if he only has 7 now?